The Simpsons Archive is a The Simpsons fansite that has been online since 1994, that originated from information posted on the alt.tv.simpsons newsgroup. It is maintained by many volunteers, from places such as the newsgroup, and The Simpsons-related forums; the information compiled on the site is from every aspect of the show, such as detailed guides, upcoming episodes, merchandise, episode capsules (text files with heavy detail of every episode), the latter one of the features that has popularized the site. The site began in 1994 as the brainchild of Gary Goldberg, with extensive help from alt.tv.simpsons members, including Raymond Chen and Dave Hall, whom respectively was the first to compile episode capsules, and was one of the online fans to become experienced at list-compilation tasks. The site was originally based on the famous Widener archive, which was set up in 1989 by Brendan Kehoe. In 1996, a conflict took place between many The Simpsons fan site webmasters and Fox, specifically its legal department. To hopefully avoid oppressive cease and desist letters, the site from then on contained no multimedia or interactive features whatsoever, focusing its content on being textual, a practice which has remained to this day. In 1998, it changed from its Widener archive-like appearance and revamped itself to the more subdued style of black and yellow, that still remains to this day. As of October 2005, it receives roughly 1.2 million hits a month. In late 2013, the site changed its web address from snpp.com to simpsonsarchive.com. On August 8, 2014, the website's old address snpp.com was closed down, ending its long history of being referred to as 'SNPP'. Guides to upcoming national schedules in the countries of (including, but not limited to) USA, UK, Australia, New Zealand, Russia, as well as details on episodes in production. Brief episode synopses for each episode, including guest stars and first character appearances. Probably the site's most well-known feature: almost encyclopedic-like text files documenting quotes and scene summaries, freeze-frame jokes, reviews, animation errors and any other insight necessary. The capsules are mostly compiled from documentation posted to alt.tv.simpsons. The episode capsule is a convention that has since crossed over to many other TV show fansites and newsgroups, including co-Matt Groening animation Futurama. However, episode capsules have not yet been produced for post-"The Bart Wants What It Wants" episodes. A collection of both internal and external copies of academic papers, articles, interviews etc. relating to the show, dating back as far as 1987, the year the Simpson family began appearing regularly in segments on The Tracey Ullman Show. A comprehensive list of links to hundreds of other related sites, from fansites and character sites to the homepages of the cast and official sites. In September - November 2008, this wiki was featured fansite. A news page, home to articles on new The Simpsons-related information, events and products. It also has a news archive dating back to 1996. In addition to this, the site offers a search facility and an About the Archive page which allows you to contact any of the various maintainers and check which new pages and episode capsules have been added since your last visit. 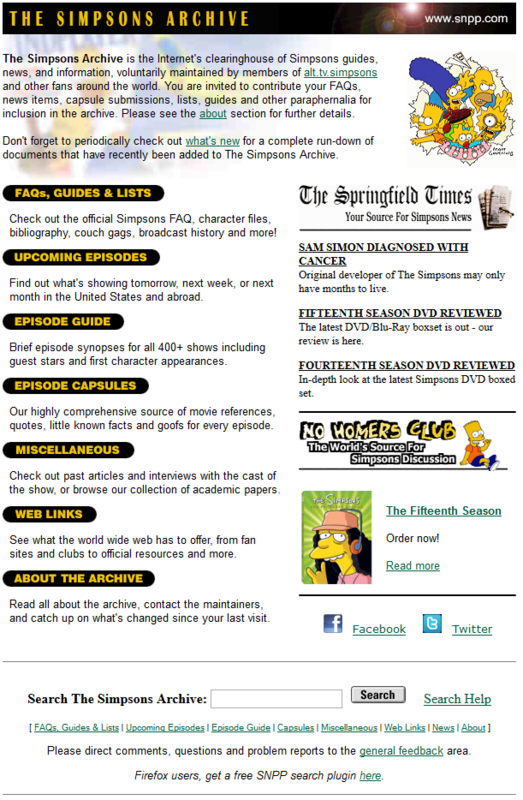 A former site feature, Simpson-L, a site-moderated emailing list, similar to newsgroup alt.tv.simpsons, closed in November 2010 after 14 years. The site has been featured in several publications, including the UK magazine WebUser - in 2002 the site was ranked #3 in their list of the "Top 100 TV Websites", as well as several unofficial The Simpsons books including the analytical Planet Simpson by Chris Turner and the UK-issued episode guides Pocket Essentials: The Simpsons by Peter Mann and I Can't Believe It's A Bigger, Better Updated Unofficial Simpsons Guide by Warren Martyn and Adrian Wood; the former publication's author stating that the book would have been impossible without the site in the book. In 2007, it was ranked #5 on Entertainment Weekly's list of "25 essential fansites". Matt Groening, creator of the show, was once quoted in the Argentinian newspaper La Nación in 2003 as saying: "Sometimes we have to look at fan sites to remember [what we have done before]: one of the best is www.simpsonsarchive.com. I have no idea what those initials mean, but it has a lot of stuff. Though for them, every episode is the worst ever." Reviews from the site's episode capsules have also been frequently mentioned in DVD commentaries by various members of the show's staff. Modified on December 26, 2016, at 20:44.